The second day of the work week was dedicated to delving into the history and subjective experience of living in Tierra del Fuego. Maria Luisa Murillo’s photographic work addresses issues of territory, immigration and nostalgia from different angles. She returned to the history of her great-great-grandmother’s arrival on the island from Switzerland, who was later to become the founder of the main timber factory in Porto Yartou. Maria Luisa talked about her series of photos of abandoned interiors of buildings, mixing European and Austral territories. The artist also discussed the Casa-Museo Alberto Baeriswyl where she works, discussing the importance of making the family legacy well known within the framework of a project of patrimonial recovery and of promotion of ecocultural tourism currently developed in Porto Yartou. Conceived as a warm and welcoming house or ‘museo habitable’ rather than a traditional museum, visitors become free explorers of the histories of the place through various digital devices and platforms as there is almost nothing material left to exhibit but oral heritage. The art historian Carla Macchiavello showed some (arbitrarily chosen) contemporary Chilean works of art produced from the mid-1970s to the mid-1980s (Cristian Silva, Eugenio Dittborn, Ronald Kay, Catalina Parra, Marcela Serrano), with a focus on the period 1971 to 1973 during Allende’s government. 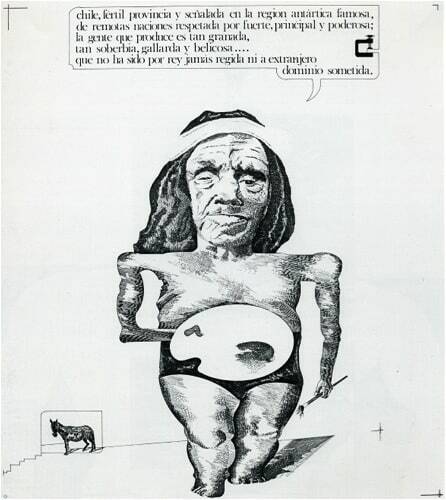 Carla reflected on the ways in which this “political” and “social” art was connected with a much more popular one, while the government was leading campaigns promoting a ‘Chileaness’, tracing both imaginary and physical borders of the country. These ‘avant-garde’ artists were extremely conscious of their role in generating increasing awareness of the political situation whilst avoiding ‘folkloric’ and ‘indigenous’ representations of the ‘other’. Even though Tierra del Fuego almost never appeared in their works (and if so as a blank zone) these artists were obsessed with traces of borders of ‘the country’ and started to represent the emergence of socially marginalized bodies which began to appear as ghost figures in their works.